High Quality, Brush is made with a 4 inch stainless steel blade which will trim off loose dog or cat hair (shedding hair) without posing any harm to your pet. Also comes with a protective cover for the stainless steel blade in order to ensure the longevity and quality of the blade. The blade is removable from a very sturdy handle that will not break for storing convenience or for swapping out blade sizes. 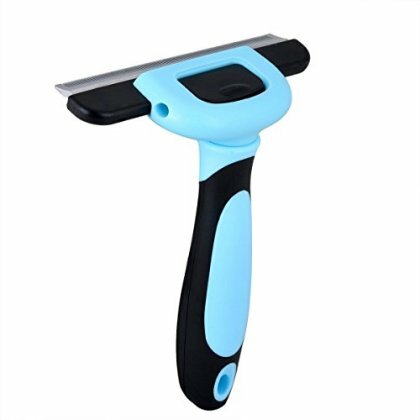 Good For Your Pets Health, 1) This tool will help to remove excess hair in order for you to more easily inspect your pet for tics or any other skin ailments that your pet might be having. 2)This tool will help to prevent your pets hair from being tangled in knots allowing your pet to be more comfortable and therefore experience less stress. 3) Your pet will enjoy the feeling of both being brushed as well as enjoying the feeling of their new sleek coat of fur. Removes up to 95% of your Pets shedding hair. This will save you time from having to vacuum or clean up all of this hair later. Grooming your pet with this brush will take just minutes and is as easy as simply brushing your pet within seconds of brushing you will begin to notice how much loose fur it is removing with no harm to your companion. - Good for your health, Helps to keep animal allergies at bay by removing excess fur therefore limiting the amount of animal dander in your house. Recommended by Veterinarians As Well as Professional Pet Groomers for Maintaining and Enhancing the Health of your Pet. One of A Kind Guarantee! Don't Like the brush for any reason at all? Send it back and we will give you a full refund or a replacement brush, Your choice!